A funeral is being held for a 26-year-old woman who gave birth to a baby boy on Thursday despite being brain dead since December. International sportswoman Catarina Sequeira was declared brain dead after an acute asthma attack at her home. The baby, named Salvador, was born when she was almost 32 weeks pregnant and is being cared for in a neonatal hospital. This is the second such case in Portugal of a baby born to a mother who was brain dead. A talented canoeist who had represented her country, Sequeira had suffered from asthma since she was a child. She suffered an asthma attack when she was 19 weeks pregnant and was put in an induced coma. However, her condition deteriorated and within days she was declared brain dead on 26 December, reports say. 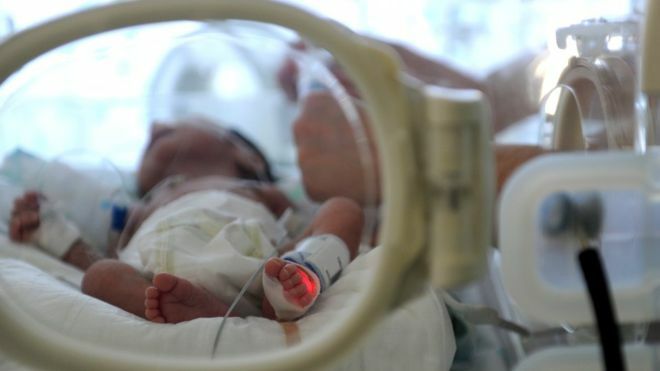 For 56 days a ventilator was attached to her to enable her baby to survive in her womb. Doctors said the intention had been to wait until Friday for the mother to reach 32 weeks' gestation, but her respiratory condition had deteriorated and the Caesarean section was brought forward to Thursday. Thirty-two weeks was considered the period at which babies had a very high probability of survival, hospital officials said. The head of the hospital's ethics committee, Filipe Almeida, explained that the decision to keep the baby alive in the mother's womb was made in discussion with the family and because she had never opted out of Portugal's presumed-consent organ donation law. "Being a donor is not just about being in a position to donate a liver or heart or lung, but also being in a position to give yourself so a child can live," he said. "And no-one has the right to interrupt the mother's decision process," he told the Observador website. The baby's father wanted the child to be born, as did the rest of the family. Sequeira's mother, Maria de Fátima Branco, told Portuguese TV that she had said goodbye to her daughter on 26 December and the decision to keep the baby had been made because the father, Bruno, had always wanted to be a father. The baby was born weighing 1.7kg (3.75 lbs) and is expected to remain in hospital for at least three weeks, reports say. In 2016 another baby, Lourenço, was born in Lisbon after surviving 15 weeks in his dead mother's womb.